The people who enforce the law, shouldn’t be above it. It’s the basis of any modern society. But what happens when those entrusted with the responsibility to enforce the law break it themselves? A video went viral on social media showcasing police officers doing just that. Everyone knows the smoking ban took place this year but it seems that our police don’t. Not a case of ‘leadership by example’ for sure. The image of a police officer puffing away at an eatery is definitely a no-no in the eyes of the public, as China Press reports. Enraged, netizens threw flak at the police officer for breaking a law that he has sworn to uphold. Another wrote, “This is humiliating. I would be rather happy if this person loses his job,” mentioning @PDRMsia in their tweet. Another had an idea to keep the video to serve as a backup when confronted by the police. It is just unfair for the public to brand the police force a failure as a whole just because of several rotten apples such as these. Additionally, it’s not verified if this incident occurred this year when the smoking ban entered full force. The public shouldn’t be so quick to judge without having all the info. 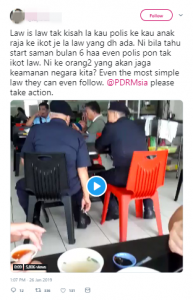 One thing’s for sure: more should be done by the PDRM to ensure that its officers are kept in line, especially in the era of social media where everything is under scrutiny.